Homes can be heated in many ways in order to keep occupants comfortable in cool or even frigid climates. In this guide, we will compare gas furnace and electric furnace options. The electric furnace should not be confused with an electric heat pump 1, which produces both cooling and heating. Both the gas and electric furnace units discussed here produce only heat but in two different ways. In order to find the right furnace for your home, it is very important to choose carefully between the electric and gas options. The initial costs are different, as are the maintenance requirements and operating costs. Also, when installing a gas or electric furnace, choosing the correct size unit is essential. A furnace that is too small will not heat the home properly. One that is too large will turn on and off more often than necessary, causing the unit to need more frequent maintenance. In the sections below, the differences between the furnaces will be explained in order to help you choose the correct type. Both gas and electric furnaces work using a forced air heating system. 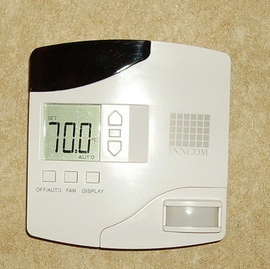 The first piece of equipment used in both furnaces is the thermostat 2. When the temperature in the room falls below the heat set point on the thermostat, a signal is sent to the furnace unit. In the case of a gas unit, the signal will cause the pilot light to ignite the main burner of the heat exchanger. The pilot light is a small flame that is always burning. 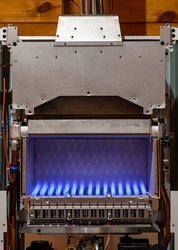 The heat exchanger draws heat from the main burner and heats the air that will circulate to the house. By contrast, in an electric furnace, an electric ignition receives the thermostat signal and activates electric heating elements inside the furnace. In both types of furnaces, heated air is forced by a blower fan through the ductwork into the various heated rooms of the house. Cooler air is drawn through an intake vent to return to the furnace. When the desired temperature is sensed by the thermostat, the furnaces shut off their heating elements. 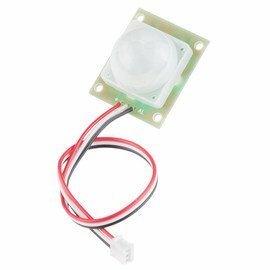 The fan dissipates the remaining heated air and shuts off as well. Many websites offer DIY tips and instructions for installing gas and electric furnaces. However, most professional heating, ventilation, and air conditioning (HVAC) experts agree that these tasks are best left to the professionals. The main difficulty in installing a gas furnace is the safety factor of dealing with the combustive element, usually natural gas. The heat exchanger and other elements must be sealed perfectly to prevent leakage of carbon monoxide, a deadly gas, from the system. The process of installing a gas furnace requires specialized tools, equipment, and knowledge that even a seasoned DIYer will not have. It is also time consuming. A professional HVAC team can take several days to completely install and set up a new unit. The high voltage required by the electric furnace is one reason professionals are the best choice for that type of installation. Heavy duty wiring is required from the furnace to the electrical breaker box. In order to ensure the safety of the home’s occupants, all municipalities have stringent inspection processes to make sure all installations are done properly. This is another reason to allow professionals to do the work for you. Higher efficiency can be gained in a gas furnace with an alternative to the traditional pilot light such as an intermittent, direct spark, or hot surface ignition. The higher cost of a more efficient gas system will most often be offset by lower fuel costs in regions with harsh winters. Electric furnaces are generally less expensive to purchase than gas furnaces and cheaper to install. The cost of a new electric furnace ranges from $500 to $2,000, while a gas furnace will cost between $2,300 and $3,500 before installation. Installation of an electric furnace averages $1,150 while installation of a gas furnace averages $1,500. Despite the higher average efficiency and lower initial purchase price of electric furnaces, their operational costs are greater because of the cost of electric power. Even though the Energy Information Administration (EIA) expects natural gas prices to increase over the next few years, the cost will still be significantly lower than electricity. An electric furnace is easier to maintain and requires less professional attention. A gas furnace, however, needs regular maintenance by an HVAC professional to keep it efficient and safe. 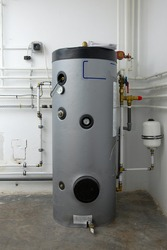 As stated in the installation section, combustion heating gives off small amounts of carbon monoxide. Only an HVAC professional has the proper equipment and knowledge to ensure that all areas of the system are sealed and working properly. Improper maintenance and ventilation can result in carbon monoxide poisoning. All gas-burning appliances should be properly ventilated and maintained to lessen this risk. Homes with gas appliances should also be equipped with carbon monoxide detectors 3 as an added precaution. Gas systems usually last about half as long as electric systems: 10 to 20 years for gas systems as opposed to 20 to 30 years for electric systems. An electric furnace is generally quieter than a gas furnace. A gas furnace will heat the home faster because the heat produced is hotter than the heat produced by electric coils. This and the cheaper cost of natural gas make gas heat a better option for colder climates. In a warmer climate with less demand for heating, an electric furnace with its lower initial cost and reduced maintenance needs can serve a homeowner better. How much does it cost to install a gas or an electric furnace in my city? Cost to install a gas or an electric furnace varies greatly by region (and even by zip code). To get free estimates from local contractors, please indicate yours.